Being an advertising company, the client uses huge number of vehicles for field displays. As there is a lag in monitoring the vehicle’s current location, the client faces a major challenge in diverting the vehicles to peak areas instantly. The client needs a solution to manage the display vehicles to improve business results. Trinetra understood the business need and helped the client with getting real time vehicle updates. Trinetra calculates the approximate time required for the vehicle to reach the peak areas. We offered GPS fleet management solution to monitor and manage the fleet with live and current updates, it is vitally important to monitor the vehicles on the go. Display vehicles that are not being fully monitored under business hours, would lead to major challenge in covering the peak areas. Trinetra helped the client to manage the vehicles by showing location update, status on parked and idling, delay notification which helps to make quick decisions on diverting vehicle to different zones. 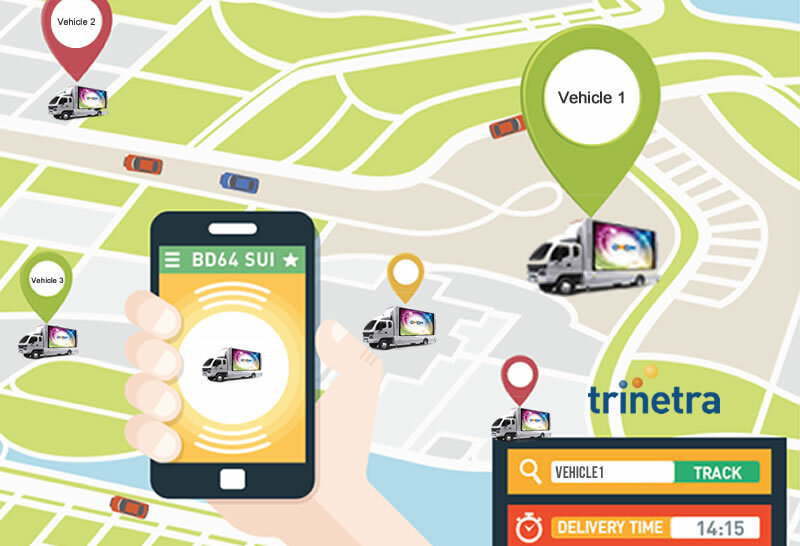 Trinetra keeps monitoring the vehicles on the go through the mobile application, making the utilization of the vehicle high in business hours. We have also offered the client with specialised integrated solutions like driver management with RFID card, panic button through which added safety and authorised person usage can be ensured to the vehicles. As the huge number of vehicles and the drivers in the field has been keenly monitored along with the real time alerts the utilization, planning the daily routine in peak areas of the display vehicles are improved.